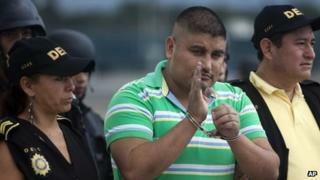 Police in Mexico have arrested one of Guatemala's most wanted men - a drug lord suspected of masterminding the killing of eight policemen in June. Eduardo Villatoro Cano - also known as Guayo Cano - was detained in the southern Chiapas state and later handed over to Guatemala. Mr Cano and another 36 men are blamed for the attack on the police station in north-western Guatemala. President Otto Perez Molina said Mr Cano's gang had now been dismantled. Nine police officers were on night duty at the remote police station in Salcaja on 13 June when heavily armed men entered the building and shot at them at least 40 times, investigators said. The police station is located near the Pan-American highway, in Quetzaltenango department. Eight policemen were killed on the spot. Their commander was taken away by the gang and is presumed dead. The massacre had a big impact in Guatemala and angered the authorities, who have vowed to punish the perpetrators. The Central American nation is being increasingly used as a transit route for cocaine produced in Colombia and smuggled into Mexico and the United States. Guatemala has one of the world's highest homicide rates, says the the United Nations Office on Drugs and Crime (UNODC), with 38.5 crimes per 100,000 population in 2011.